1959-1960: My first station consisted of a Knight-kit T-50 transmitter and a Hallicrafters S-38E receiver along with an end-fed random wire antenna and no tuner - I just stuck the feedline wire in the center hole of the SO239. Needless to say, I was NOT king of the novice band. 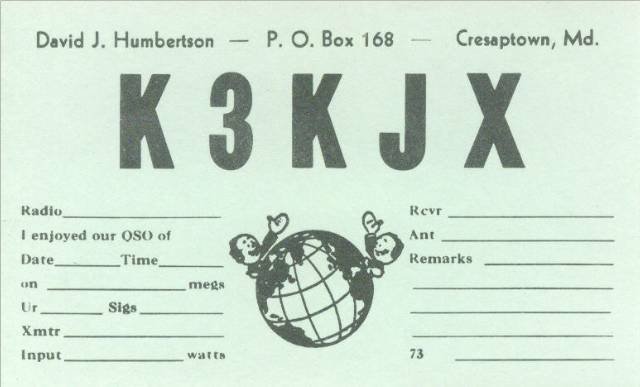 My first QSO was not until Feb of 1960 but I vividly remember it was on 3720 with a YL in Pa. (I still have that crystal). That receiver was almost unusable for the crowded novice band conditions of those days, so I upgraded to a National NC-100X that spring. Even thought this rx didn't have a direct frequency readout, it was a vast improvement over the S38. I eventually added a Heath QF-1 Q multiplier and an Olsen (remember them?) S-meter to the 100X. I upgraded to the "Conditional" license in Dec of 1960, dropped the "N" and became K3KJX. 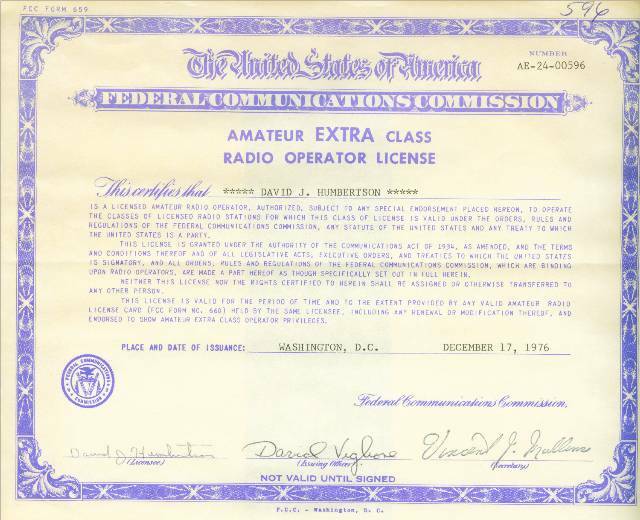 To travel to Washington or Baltimore in those days was quite a trip, especially for a 13 year old, so I qualified to have the General class license administered by a local ham (much like the VE program we have today). I received a used DX-40 and VF-1 for Christmas of '60 and also a Calrad "green bullet" crystal microphone - I could now operate "phone" as it was called then - didn't need to say "AM". Most phone ops were on AM as SSB was relatively new and AM was still the predominate phone mode. I had a better antenna now - coax fed dipole, but it was still hard to compete on 75 meters in the evenings with 50 watts or so (just like it is today). I had my best phone success on 40 meters in the daytime. When I felt like living on the edge, I would answer W2OY when he called CQ and with my boyish voice, he would respond with his famous "no kids, no lids, no space cadets, etc" speech - at least I knew I was getting out!! 1961-1965: In the summer of 1962, as a gainfully employed "newspaper boy" I was able to purchase a National HRO-50T with matching speaker and 5 coils. I put a 20 meter ground plane antenna on the roof and with my DX-40 on CW I was able to work a lot of DX. 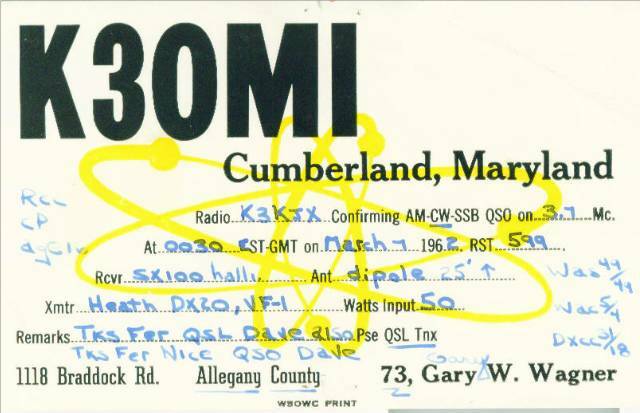 I operated mostly CW until the fall of 1965 when I bought a DX-100 from my longtime friend Gary - K3OMI. I was able make a lot of contacts on 75 AM, but by then SSB was beginning to seriously divide the band. I was in college in the fall of 1965 and my interests were being divided by the usual things of that age - cars, girls, etc, so my ham activity became sporadic at best. By the 2nd semester of my freshman year, I realized that I didn't have the desire or interest to remain in school any longer, so in Feb of 1966 I withdrew from college. Now, in 1966 if a male of 18 or 19 wasn't a student and was medically fit, Uncle Sam had a very keen interest in him. I decided to enlist before I was drafted. I had narrowed my choices down to: Army warrant officer helicopter pilot program or, the USAF in the electronics field. I had taken all the tests and had qualified for both. 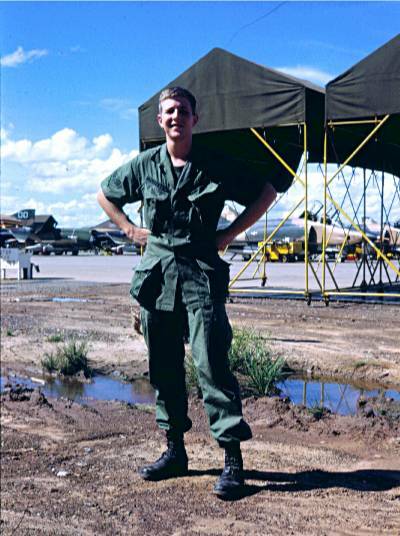 I ended up choosing the Air Force and left for basic training in March of 1966. History would prove that I most likely made the right choice. 1966-1969: After completing basic training at Lackland AFB, I was sent to Lowry AFB in Denver, Co for tech school in the Weapons Control System field. 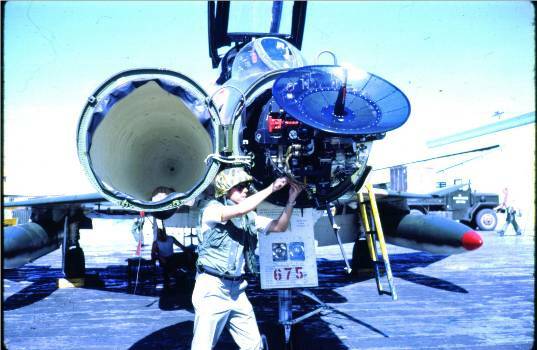 It was a 9 month program, but due to the increasing need for our specialty in the escalating war in Viet Nam, we went to around the clock training. While there, I went to a radio store in Denver and bought a Knight-kit T-60 transmitter and a Heath HR-10B receiver. I erected a "secret" 40 meter dipole against the barracks wall and had my mother send me my "TR" box, key, and headphones. I operated 40 m CW for several months as K3KJX/0. My first actual duty assignment was at Eglin AFB in Fort Walton Beach, FL. I had a car then and I took my HRO with me and using the T60, operated as K3KJX/4. While stationed there I took a weekend trip to visit my ham radio friend Gary K3OMI who was then stationed at Keesler AFB, in MS. He was married and had an Eico 753 setup in his off-base housing. I was sent to SE ASIA in Oct of '67 and remained there until Nov of '68. While at an air base in extreme NE Thailand near the Laotian border, I met a civilian TECH REP for one of the companies that built the radar system on the F4C aircraft that I worked on. I remember helping him (a K1xxx from Maine) erect an antenna for his Swan rig and I actually worked SSB from there. We would meet again later on at Cam Rahn AB in Viet Nam but there was no ham radio there. He had a tiny battery operated TV set and I have vivid memories of watching the show "Combat" being broadcast by the AFVN, with the TV sitting on a pile of sandbags as we drank beer and watched the Korean (ROK) troops across the bay shell enemy positions with 105mm artillery, just miles inland. It was a strange place indeed. 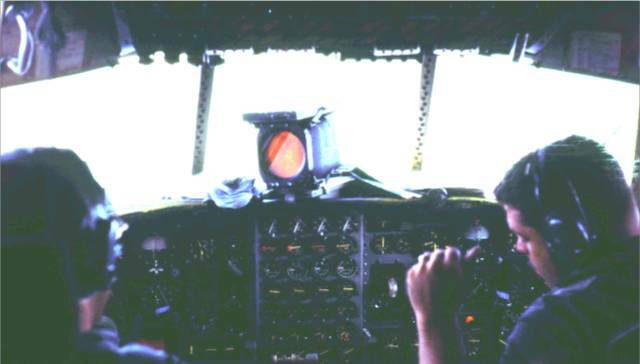 Here is a PICTURE I took on the flight deck of a C-130 while flying between bases during my tour over there. After arriving back in the states in late 1968, I finished out my enlistment in Florida at Macdill AFB. I had always wanted to learn to fly, so I joined the base Aero club and worked as a dispatcher at our club, trading my time worked for flying time. I ended up with 28 hours - about 13 of them solo before I was discharged. When I got home and checked the price of instruction at the local airport, I knew there was no way I was going to be able to continue on, so that ended that. 1970-1976: After my discharge from military service in Dec of 1969, I returned home to the Cumberland, MD area, got a job as a quality control technician at a Celanese synthetic fibers plant and started taking QC type college classes at a local Community College. I was totally inactive until 1972 when the bug again bit and I discovered that my ham ticket had expired, and while I was still in the grace period, I did not have the then required amount of operating time to renew so I brushed up on my code and ham regs and took a trip down to M street in Washington, DC and got my Advanced class license. While I still had the T60 and HR-10 (I had sold the HRO) My "first rig" this time was a Heathkit SB-102. I operated mostly CW for several years using a Vibroplex bug. I built a SB-200 in '73. I even homebrewed an 80/40 meter receiver with crystal filter and a homebrew 5763 transmitter. Some changes in my personal life put me off the air for a year or so in 1974 and 75. The company I worked for began the process of closing the local plant and I found myself out of work in early '75. During this time I started studying for my commercial radio-telephone ticket, took the exam and received a 1st class commercial license - which has since been dumbed down to a general radio-telephone. I opened a small electronics repair shop and took advantage of the then lucrative CB radio repair business. This necessitated getting on the 11 meter band as the "radioman"....lots of business from truckers calling for that "one radioman" "hey radioman, I need someone to take a look at my radidio...she just ain't talking so good, doncha know? - bring it on back radioman" - What I had to put up with to make a buck!!! I had sold my Heathkit gear when I got out of work so I decided to buy a brand new Drake C-Line and a Heath SB-220. I had gotten interested in fire and rescue work while serving as a volunteer fireman during my out of work time, so when I got really burnt out on fixing CB radios and being self-employed with no insurance, I took the civil service test for the position of firefighter with the city of Cumberland, Md and was hired in the summer of '76. My wife and I bought a house in the city right after I was hired so I looked forward to being able to put up real antennas again. I loved my job at the Cumberland City Fire Dept - most exciting job I have ever had. I was a pipeman (guy with the hose), an EMT, and I passed my Paramedic - (CRT) course right before I resigned to work for a two-way radio shop and then the railroad. When our first child came along and my wife quit her job to stay at home to raise the kids we just couldn't make it on the city salary. In late 1976 I took another trip to DC and got my EXTRA ticket. Remember when they used to give that special certificate? 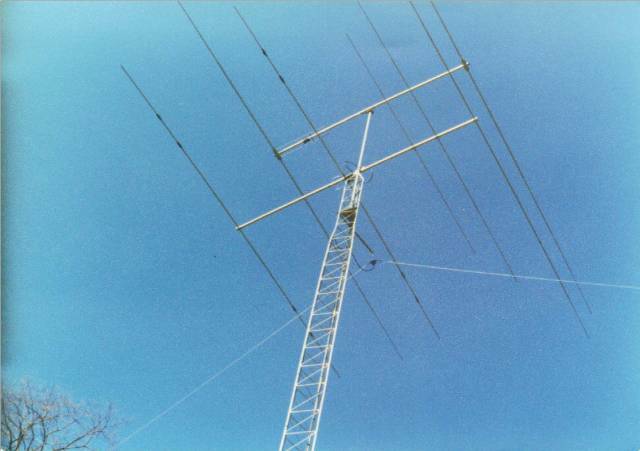 1977-1990: It didn't take me long to get a 40' Rohn 25G tower up against the side of the house. The tower was topped with a Mosley TA-33 and a 75/40 meter fan inverted Vee antenna. I had never had a yagi before and I really got into the DX thing....working mostly 20 as the sunspot cycle was not at it's most favorable spot. The tower soon grew to 50' and then with the help of some of my firefighter buddies, I "grew" the tower to 80' guyed and then added 10' of 2" mast on top of that. I ended up with a 4 element yagi for 20 and a 2 element yagi for 40 at 90'. The "problem" with this was that my city lot was 50' by 110'. Yes, the neighbors didn't much care for me. Being a city employee, I was able to get a permit for the first 40' tower that didn't have any height restriction on it, so I was "legal". with my 90' monstrosity. I did very well on 20 meters, even working long path into VK land and becoming a regular on the band. After 2 years at that location, we found a nicer house with more room only about a mile away, so down came the tower. I opted for a self supporting aluminum tower at the new location - a Height's 60 footer. I put a Telrex tri-bander at 60' and the 2 el 40 m yagi at 70'. Here is a PICTURE of that setup. After a few more years of "regular" hamming, I became bored with the whole thing - it had become to easy to make a contact - there was no challenge - I had become totally disillusioned with ham radio. 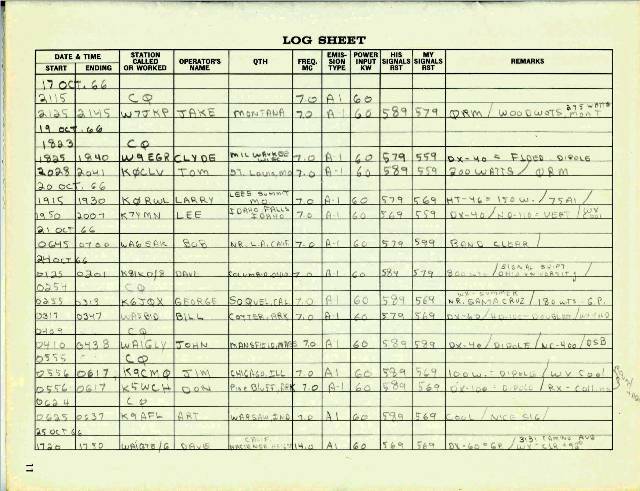 It was sometime around January of 1980 that I was tuning the R4C around 75 one night and I came upon W8VYZ and some others in an AM QSO. The conversation was interesting, the audio was good, it brought back memories of ham radio as it was when I first got hooked. It didn't take me long to locate a DX-100 in town for $25 and for another $50 a GPR-90A receiver. I drug out my old "TR" box and my green Calrad xtal mic and I was back on AM. I soon added a Viking II and 122 VFO, then a NC-300. I was on AM everyday after that. Staying up on weekends working Ed WA3PUN, Joe W2WAS, Howie W2NRM, and the list goes on. In April of that year '80, I came across a Johnson Viking KW complete with the desk pedestal at the Timonium hamfest - had to pay a whopping $200 for it but it sure seemed worth it. Picked up a ranger to drive it and modified an Eico 730 modulator to use as an audio driver - I was having fun with ham radio again. More time on the bench, always something to build or modify. Interesting QSO's. Saturday nights with Ozona Bob and company on 7160 - I had almost forgot about our activity down low on 40 AM. For a Christmas present in 1980 my xyl bought me a local one owner 74A4. In the fall of '81 I bought a Collins KW-1, serial #150 from a guy down in Arkansas and had it shipped up on an Allied moving van. That KW-1 cost me $900 - an outrageous price I say!! - Right? I was on almost daily in the early 80's, mostly on 75. It was about that time that the proliferation of cheap consumer electronics began in earnest. I soon found that 750 watts output on AM in a city environment made me very unpopular, with the phone literally ringing off the hook every time I got on the air. Cable company trucks here, phone company trucks there. I eventually got on less and less and then only late at night. It was during this time that I sold all my high power gear and just used my Viking II. I had left the fire department for my current job with CSX railroad and no longer had to live in the city so we decided to move whenever we could afford it. It was in early 1990 that we came across the 2 acre piece of ground that we are now on here in West Virginia. We built our house here in June of that year. 1990-Present: From 1990 until 93 or so, all of my time was taken up with the house and the land here (my wife, kids, and I had done all of the clearing of the land and we had piles of stumps, brush, dirt, etc), but I did manage to start putting a station together in 1992. I had a nice R390A that I rebuilt while still in Cumberland and I picked up a nice clean local Valiant that I did the ER featured mod "Curing that Valiant Sound" on. I still had the 75A4 and the Viking II. In 1997 or so I got my T-368, then a few years later the homebrew 812 rig, and shortly after that the Gates BC1G and the Meissner. So far, I have not had any complaints about interference to anyone. My nearest neighbor is several hundred feet away.